Our 1,600 square foot, 3 bedroom (the 3rd bedroom is a loft), 2 bathroom home is on 1.3 acres and is situated on the edge of a ridgeline offering amazing views of the Hermosa Cliffs and of the Hermosa Valley. This residence combines rustic charm with modern luxury amenities and superior location, as it is only 6 miles from Durango Mountain Resort (Purgatory) and 19 miles from historic downtown Durango. The home features a hot tub with amazing views, wood burning fireplace and TVs in the Master and 2nd bedroom. In addition, there is a gas grill, picnic table, washer/dryer and WIFI. The home was beautiful, cozy, and clean. We arrived late (around 7pm) and I couldn't find the coffee to get in the home. The management company was available and got us in the home very quickly. We accidentally left my husband's eye glasses after we left the home and the company found them and sent them back to us. Just make sure you have 4WD for this particular home if you're going during snowy weather. We will definitely be using this company again. Thank you!! We appreciate the thoughtful review! 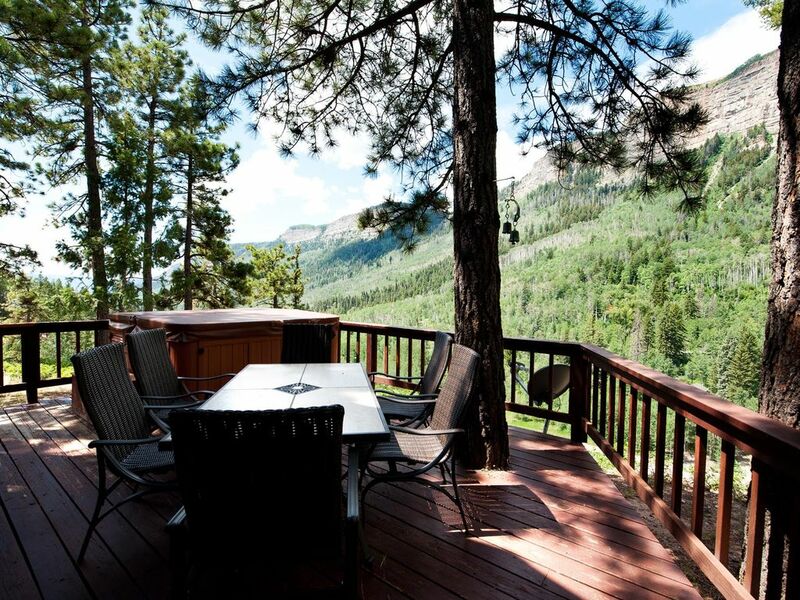 It was a pleasure to host you :) We are glad you enjoyed your stay and we hope you choose Durango Premier Vacation Rentals again for your next visit! Thank you for taking the time to write a review regarding your recent stay with Durango Premier Vacation Rentals. We're glad to hear that you and your party enjoyed several components of your stay! In order to ensure the best quality sleep while on vacation, we always encourage guests to book homes with the appropriate number of actual beds for all of the couples in their party to avoid the inevitable sleeper sofa disappointment! Nothing beats sleeping in a comfy bed in a private room when you're on vacation with your friends! Thanks again for taking the time to write a review. If you love scenery, trees, and nature than this is the perfect retreat! Not to mention the house itself! The house inside is beautifully decorated and so very homey and comfy! We felt relaxed as soon as we walked through the door! The master bed and pillow were very comfortable and the kitchen was very well stocked! We loved sitting in the hot tub after our long hikes while enjoying the beautiful surrounding scenery! Around the house itself are neat short trails. One will take you to an overlook of Electra Lake. My husband and I took a picnic lunch there one day and sat on a rock overlooking the lake. This retreat is centrally located around many different activities! Going South it is an easy drive to Durango and the Durango-Silverton Railroad. Also, to the Four Corners and Mesa Verde National Park. Haviland Lake is just a few miles down the road and has a beautiful trail around the lake. Heading North there is a mountainous stunning drive to Silverton and then on to Ouray. There are many trails just along the highway and a few ghost towns!! Not too far up the road is a really neat trail called the Purgatory Flats Trail. Honestly, this vacation was like a wonderful dream and we plan on coming back to this awesome retreat! We definitely recommend staying here! This is minor and just a suggestion. It would be nice if there were directions on the fireplace. We did not know if we had to open a damper or if that fan needed to be on? More instruction on that would have been nice. We were afraid to use it. Maybe on the T.V's too. We are stilled old schooled and had a hard time figuring out how to work the T.V settings. We did figure it out though! Thank you!! Had a wonderful time and everything was wonderful with the cabin. Thanks! This cabin was great, and has an awesome view and located perfectly for lots of trail heads nearby, as well as easy trips down to Durango, and up to Silverton. Best location we've stayed in Durango yet. Only down side was the lack of hot water for showers, the hot water ran out after about 6 min each day, so with our party of 6 people, only 1-2 got a shower each morning or evening. Besides the hot water, we all really enjoyed this place, and would stay here again (hoping they hot water is fixed) as well as recommend this to anyone! Loved our time and trip, stayed 6 nights. Three generations of our family stayed at the Cliff Side House for a week and had a great time. The views from the house are spectacular; the house is very private; and the place is very well equipped. We would not hesitate to stay in the home again. We also liked the fact that the temperatures at the house are much cooler than in the town of Durango so it was very comfortable all the time. Also, the photos of the house that are on the website are very accurate.